The Yotaphone is about to lose its title as the world's only dual-screen smartphone. The Oukitel U6 is a budget-priced competitor with a 5" LCD screen, a 4.7" E-ink screen, and a price tag less than half that of the Yotaphone's. Edit: It's also apparently a rebranded Huateng Flag D1. The U6 is not available in the US, but it is up for pre-order on Geekbuying, a site which ships Chinese gadgets to the US. It is expected to ship in on 31 August, but since this is a complex device from an unknown company, I would take that with a grain of salt. According to the specs, this smartphone runs Android 5.1 on a 1.3GHz quad-core Mediatek MT6735 CPU with Mali graphics, 2GB RAM, 16GB internal storage, and a microSD card slot. It ships with two SIM card slots, two cameras (13MP and 5MP), and a bevy of sensors. In terms of connectivity, it has Bluetooth, Wifi, GPS, and 3G/4G. But how well does it run? That's the question we should be asking. Watch the demo video (or the other one I found on Youtube) and you'll see that the U6 is only just barely using its E-ink screen. You can push a gallery image to it, or display contact info, or post a calendar and agenda, but that's about it. There's also a reading app for the E-ink screen, but I got the impression that it's not working all that well. In comparison, Yota Devices has invested years of work in developing software so you can use the Yotaphone's second screen to its fullest. It lets you run many apps on the E-ink screen, and also features numerous apps that were customized to run smoothly on that second screen. 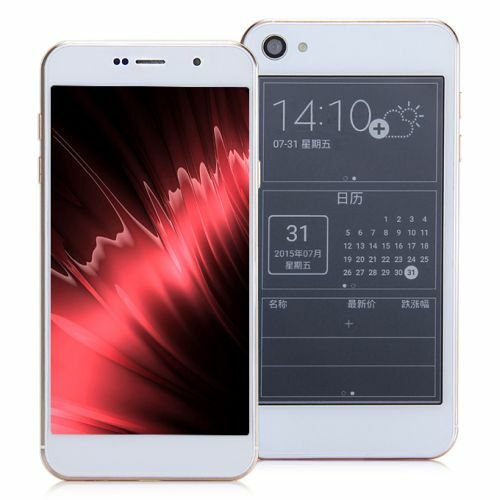 Oukitel is promising that more apps will support the E-ink screen soon, but they have not said when that will happen. It does look like this phone, yes. I hadn’t noticed the similarity. Good catch!